​Welcome to the Plymouth Morris Website! Friends and Families of Special Children Ltd.
​We will be presenting them with a cheque for £450 very soon from money we raised during 2018. ​Friends and Families are a non-profit organisation unique to Plymouth, providing information, support and services for families with disabled children. Our chosen charity for the coming year is the Neonatal Intensive Care Unit (NICU) at Derriford Hospital. Collections raised by the 7 performances of our Mummers Play in December 2018 raised £447.12 for NICU, which we will round up to £450.00 and add some more to it at the end of the season. Our collection on New Year's Day at The Dolphin was £150.00 which we donated to their chosen Charity. Plymouth Morris hold their practice nights on Wednesday evenings from 7.30pm - 9.30pm at the School of Creative Arts, Millbay Road, Plymouth, PL1 8EZ from October to April and welcome prospective new members at any time. On Saturday 20th October we performed for The Nelson Society annual Trafalgar Dinner in the Officers' Mess at the Royal Marine Barracks, Stonehouse, in Plymouth. It was a fantastic event and an honour and privilege to be asked to perform at such a prestigious occasion and our Naval themed costume fitted the occasion well. 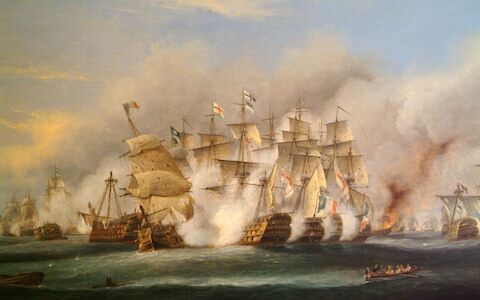 Jeff gave a rendition of 'A sailor ain't a sailor...' and Ray sang 'On Board A Man O' War' - a song about the battle and death of Lord Nelson at Trafalgar. We were well received and even had a standing ovation when we finished. On Friday 25th May, representatives of Plymouth Morris Men attended the funeral of Billy Holmes, former Landlord of The Dolphin Hotel on Plymouth Barbican. Billy was a great host to us on many occasions each year, for so many years and will be sadly missed. ​​Our provisional programme for 2019 is now available for downloading ﻿﻿﻿﻿﻿﻿﻿﻿﻿﻿﻿here. On St George's Day, Tuesday 23rd April, we will be celebrating at The White Thorn, Shaugh Prior, from 7.30pm. Come and join us! Please note all dates are provisional, unless otherwise stated, and are subject to change. The programme will be updated throughout the season with any changes so always check back here for the latest information. Plymouth Morris Men have had several foreign trips in recent years, including Holland in 2005, a trip to Hungary and Serbia in July 2006 and Jersey in May 2007. In August 2009 we went to south-western France for the 50th Annual International Folklore Festival at Montrejeau. 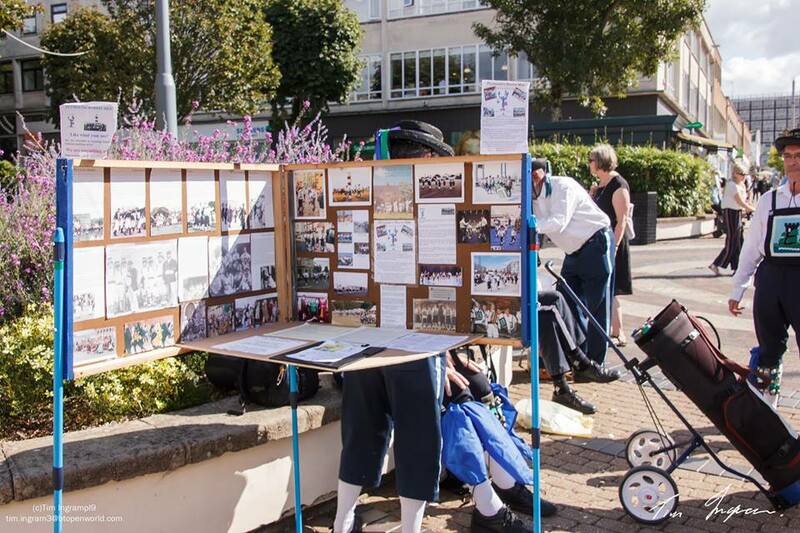 We have had several trips to Brest in conjunction with the Plymouth-Brest Twinning Association, including the Maritime Festival held every 4 years. These are now held at The School of Creative Arts, 22 Millbay Road, Millbay, Plymouth, PL1 3EG (the big red building opposite the entrance to the Brittany Ferries port) on Wednesday evenings from 7.30pm until 9.30pm. Come along at 7.30pm any Wednesday evening to have a go and see what is involved. No charge! Practices start again on Wednesday evenings from 9th January 2019 until the end of April 2019. 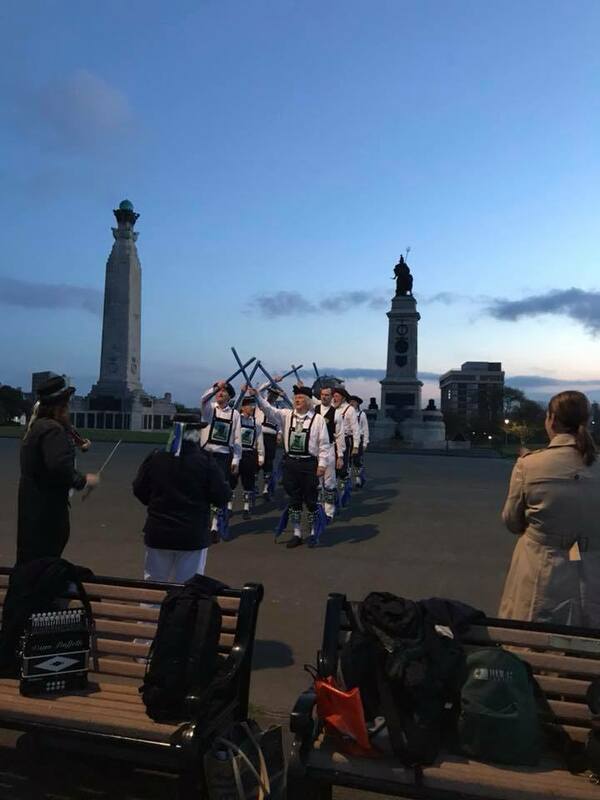 We are looking for new recruits, male or female, either dancers or musicians, to train up ready for the Mayflower 400 celebrations in 2020, when we will also be celebrating our 50th anniversary. We would particularly love to start an 18 - 30 Morris Side to take part in the Mayflower 400 celebrations. Everyone is welcome at any time to come and have a look or maybe have a go. Check our ﻿programme for details and just turn up! Plymouth Morris Men at The Tolpuddle Martyrs Museum, Dorset, on St George's Day, 23rd April 2017. In April 2017 we were in Southampton for the annual Day of Dance hosted by our great friends of King John Morris Men. On Sunday on our return home we stopped off to celebrate St. George's Day at Tolpuddle in Dorset to visit the Tolpuddle Martyrs Museum and to have lunch at The Martyrs Inn. On return to Plymouth we thought it only fit to have a photo taken where the plaque to commemorate the return from exile in Australia of 4 of the Martyrs on 18th March 1838 is situated, near the place where they came ashore, at Mayflower Steps on Plymouth Barbican. On Saturday 1st July 2017 we performed at The Horse and Groom, Bittaford, for their annual Charity Fundraising weekend, and raised over £73.00 for the Brain Tumour Charity and Riding for the Disabled. We're about to do it all again this year at the Charity Beer Festival on Saturday 7th July 2018. We'll be there from 1pm. On Friday 28th July 2017 we travelled to Kent for the 355th Morris Ring Meeting hosted by Ravensbourne Morris Men. 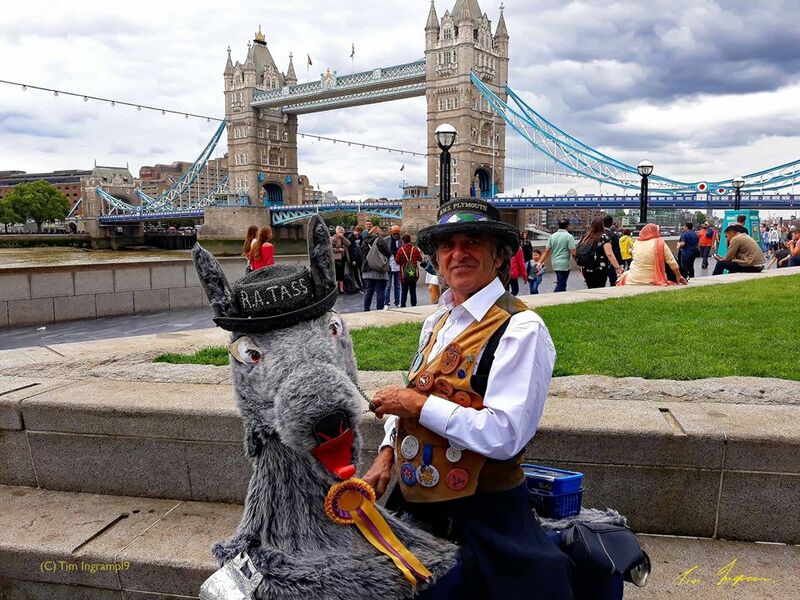 They took us on a tour around London's South Bank where we performed at various famous landmarks culminating in a massed dance of all the invited Morris sides at the Tower of London. Each year we make a donation to a charity and have raised over £5,000 over the last 9 years. On Sunday 21st March 2010 members of Plymouth Morris Men danced their way around the Plymouth Mile course for Sport Relief. We raised over £900! At our 48th Annual Ceilidh on Saturday 24th February 2018 we presented HeartSWell South West with a cheque for £500 which will be used to provide defibrillators locally in Plymouth. More details of our charitable giving can be found on our 'Charitable Donations' page. If you've seen us recently, have found this site helpful or have any comments to make about the site, please e-mail us via the 'Contact Us' page. It would be great to hear from you.